WASHINGTON – The American Farm Bureau Federation and Ohio Farm Bureau recently presented Sen. Rob Portman (R-Ohio) with AFBF’s Golden Plow award. The Golden Plow is the highest honor the organization gives to sitting members of Congress. 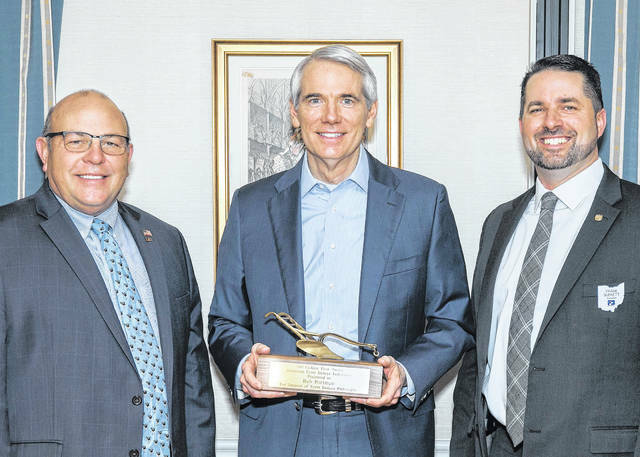 Ohio Farm Bureau endorsed Portman for the award because of his commitment in Congress to issues important to farmers and ranchers. Ohio Farm Bureau appreciates that the senator’s priorities align with those of its members. Portman currently serves on the Senate Energy and Natural Resources Committee, Finance Committee, Foreign Relations Committee, Homeland Security and Governmental Affairs Committee, and Joint Economic Committee. Portman’s work in the Senate includes strong advocacy for tax reform and leadership in eliminating the UBIT provision from the Senate tax reform bill. He also knows how important export markets are to the farm economy, especially now, as a surplus of commodities continues to put pressure on the prices farmers receive. Portman is a former U.S. Trade Representative under President George H.W. Bush. He served in the U.S. House from 1993 to 2005. AFBF’s Golden Plow award recognizes members of Congress who exemplify agricultural leadership and support of Farm Bureau policies. Recipients are chosen for having a philosophy or record that demonstrates a commitment to sound agricultural policies supported by Farm Bureau, the private enterprise system, fiscal conservatism and reduced federal regulation of businesses and individuals.